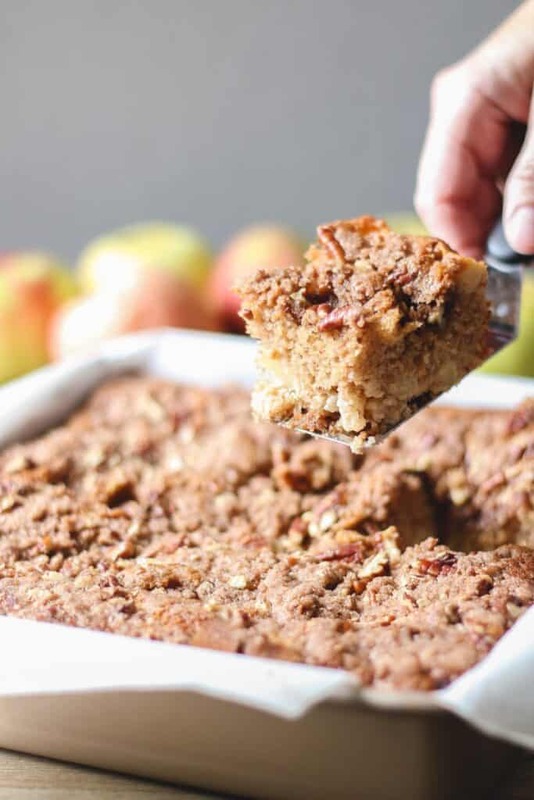 Nothing says fall to me more than apple picking and of course, Gluten-free Apple Cake! 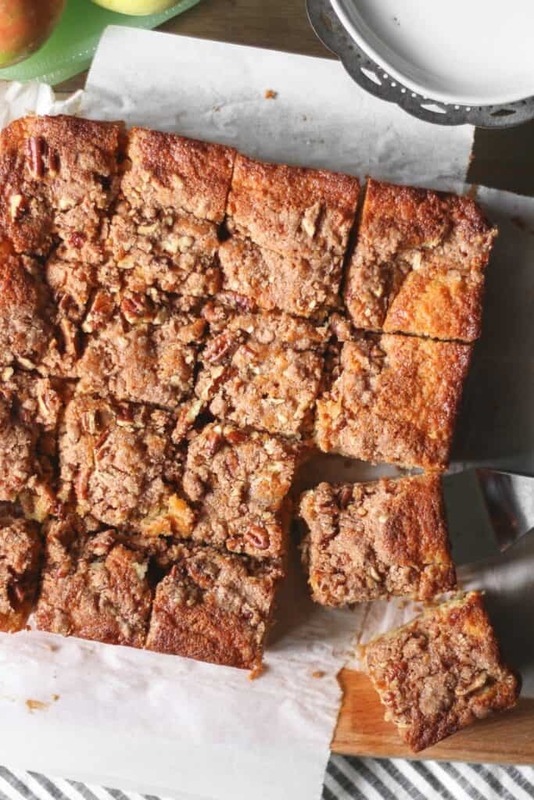 This cake is wonderfully moist, filled with fresh apples, warm cinnamon, and toasty pecans. Getting this cake right was a labor of love. That sounds so silly doesn’t it? Let me explain, I have been making a gluten-filled version of this cake since I was a kid. I love this cake. It’s one of my favorite things about fall! As you well know, I can’t eat gluten anymore, so my mission this fall was to revamp my old Apple Cake recipe. It took, I don’t know, five tries (?) to get it just right. That’s the thing about gluten-free baking, it’s tricky, kind of daunting, and not always perfect. One attempt sunk in the middle, one was overdone on the edges but underdone in the center, the streusel topping and apples completely sunk in yet another attempt. All that to say, after much tweaking and research, it’s perfect. My beloved Apple Cake is back and better than ever. 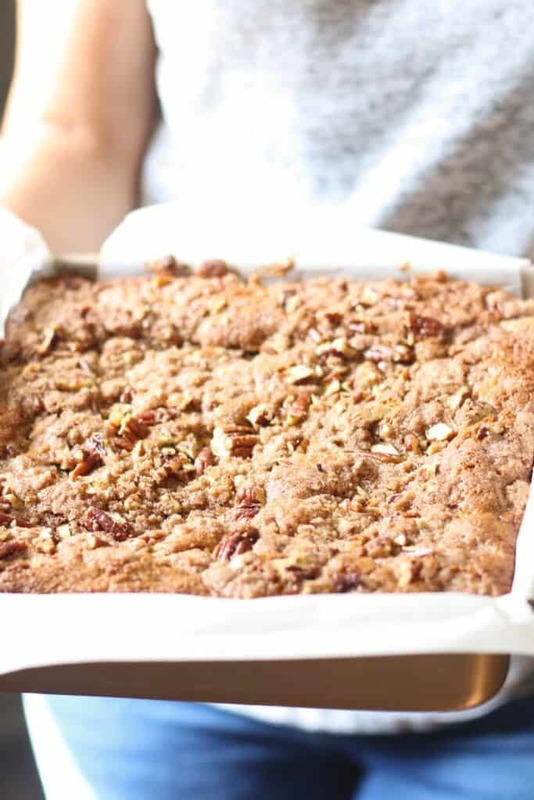 Introducing the new and improved Gluten-free Apple Cake! Flour: I went to my old standby, Pamela’s Baking and Pancake Mix, for this cake. I’ve had such great success with this mix for cakes that it felt appropriate to use it here as well! I love the mix not only because it works well but also because it’s conveniently available at my local Kroger, goes on sale regularly, and comes in a giant bag. It’s a good value as far as gluten-free flours go. Apples: I have used cortland and golden delicious apples in this apple cake but granny smith would also be a great choice. Put 1/2 tablespoon lemon juice or apple cider vinegar in a measuring cup. Fill with milk up to the 1/2 cup mark. To get started, in a large bowl mix together the butter, eggs, and sugar until combined and then mix in the buttermilk. In another bowl, whisk together the baking mix with some cinnamon. After that, dice up some apples, 2 cups… not more, not less. 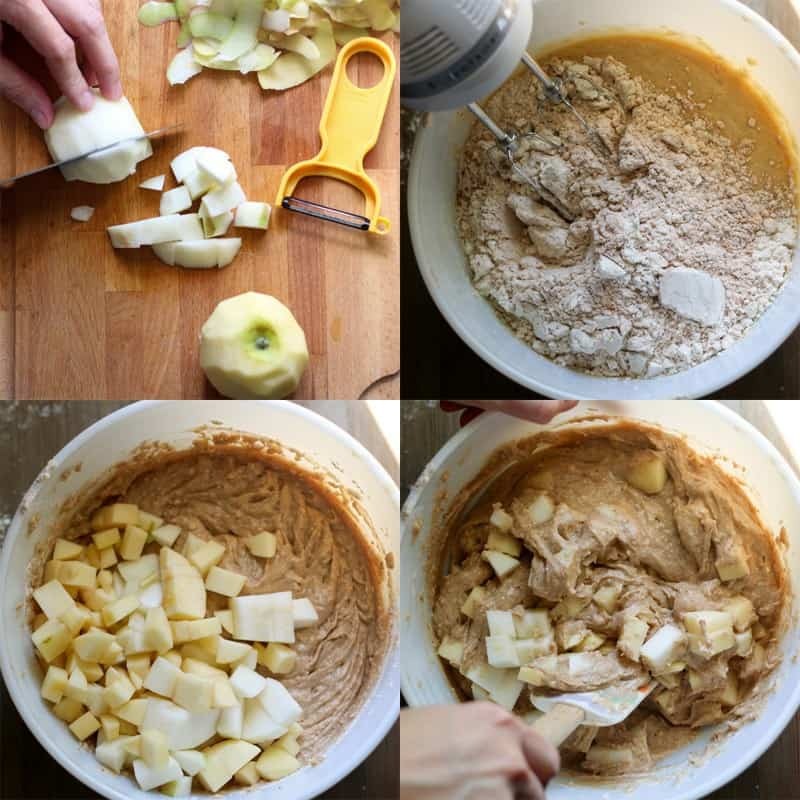 Then you’ll combine the wet ingredients with the dry ingredients and fold in the apples. Now for the best part. The streusel topping. Cut the topping ingredients together and sprinkle it evenly over the top of the cake. Bake it all up until nice and golden! There you have it! This cake requires a few different steps, but it’s nothing you can’t handle. Believe me, it’s totally worth it once you dig in to this amazing cake! Speaking of which…. 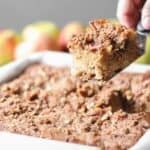 This cake is wonderfully moist, filled with fresh apples, warm cinnamon, and toasty pecans. Preheat the oven to 325°. Grease or line a 9-inch baking pan with parchment paper. Set aside. Place the softened butter, 1/2 cup white sugar, brown sugar, and eggs in a large mixing bowl. 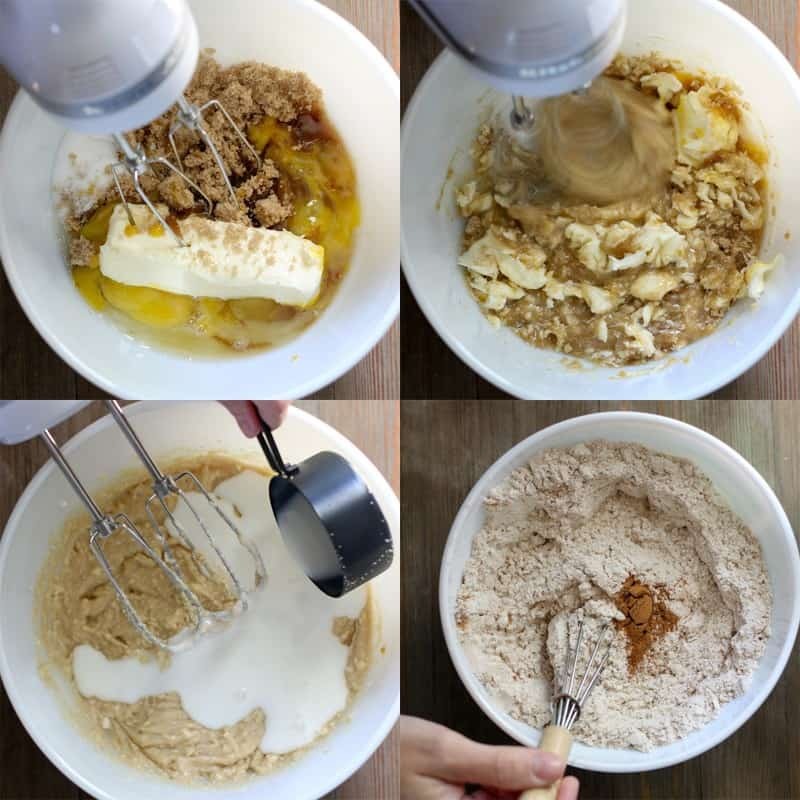 Blend together with a hand mixer. Pour in the buttermilk and mix until combined. In a separate bowl, whisk together the Pamela's baking mix and cinnamon. Then add to the wet ingredients and mix until just combined. Fold the diced apples into the batter with a rubber spatula. Then pour the mixture into the prepared cake pan. Place the butter, flour, sugar, and cinnamon in to a small bowl. 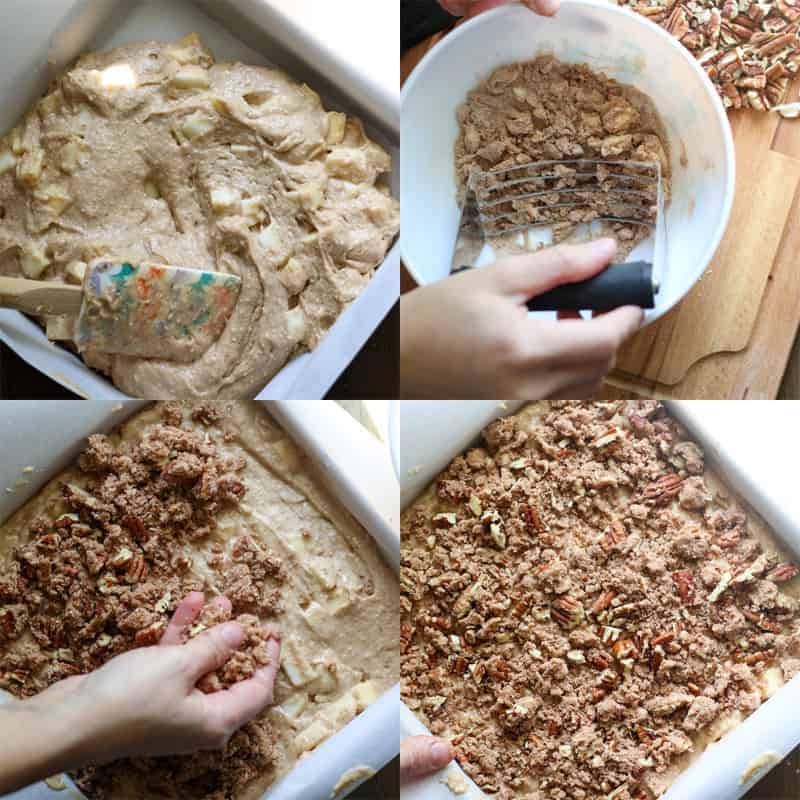 Use a pastry knife to combine the topping until the mixture is like wet sand. Add in the pecans and mix until combined. Sprinkle the topping evenly over the top of the cake batter. Bake at 325° for 50 min, or until toothpick inserted in center comes out clean. This cake will last several days, tightly wrapped, at room temperature. Got more apples? Try these recipes: this dip, or these cute little pies. Happy Baking! Yay. You did it. Looks freat. ???????????? Thank you!! I’m so happy with how it turned out!